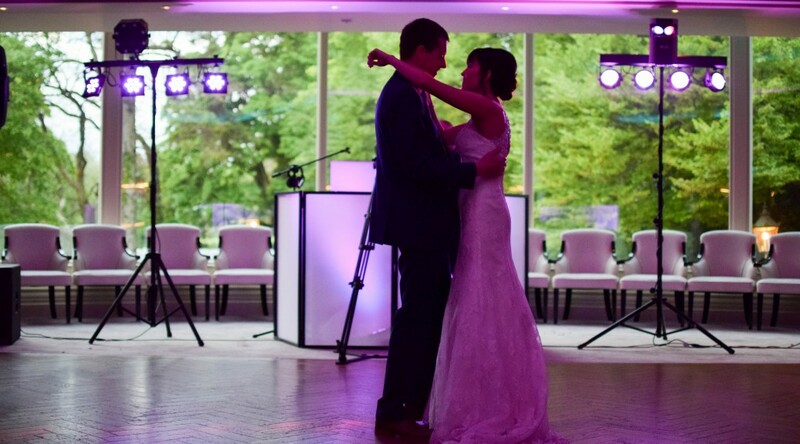 When it comes to Wedding Parties, it’s our promise to you that everyone will be in for a great night! 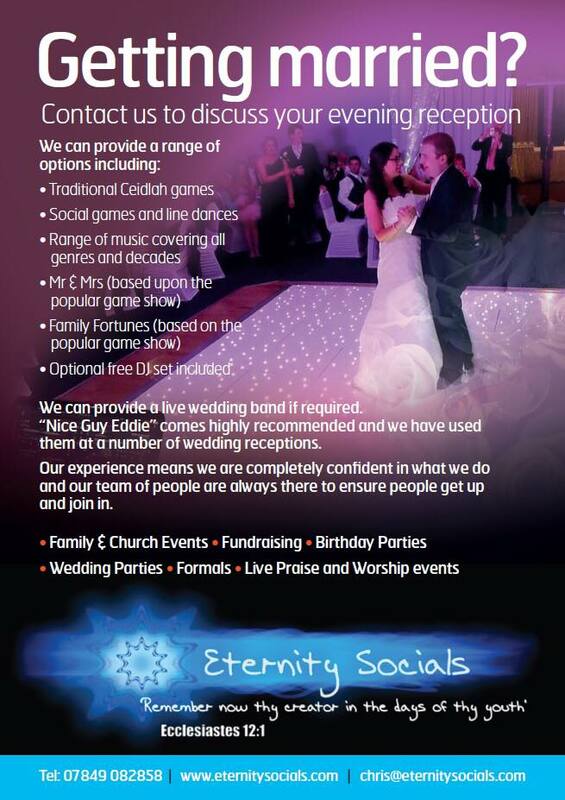 Eternity Socials have over fourteen years of experience when it comes to parties, meaning we are Northern Ireland’s longest established and most respected Christian wedding party entertainers. 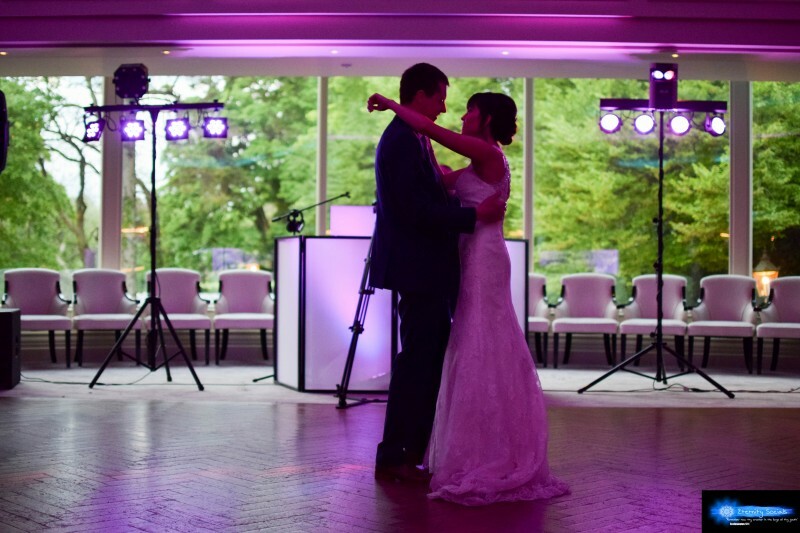 One of our team also plays music for one of Northern Ireland’s biggest commercial radio stations and our party photographer takes photos for Northern Ireland’s biggest media outlet, Bauer Media. You’re in safe hands! Since starting up in 2004 we’re the only social group to have conducted over a thousand parties meaning we have a team of guys who are fully capable of engaging with the crowd, making sure everyone gets involved in a night they won’t forget about for years to come. 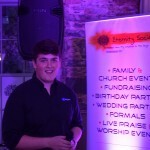 Visit our testimonials page to see what others thought of Eternity Socials! We’re also not afraid to travel to where needed! We’re glad to say we’re world renowned, having completed gigs in Canada, Scotland, England and of course, Ireland. We currently host a range of options however if there’s something not on the leaflet, let us know and we’ll try our best to make it happen. 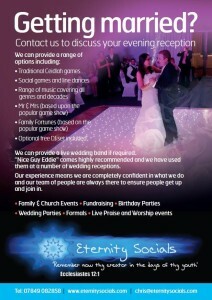 Click on our wedding leaflet below to enlarge. 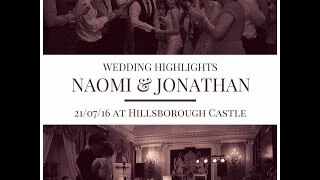 In addition to the above, we also take photos of your evening with a professional camera and occasional video footage with a GoPro Hero 4 camera, which can be viewed via our Facebook page. If you require the higher definition originals, we can get this to you! Our photographer also takes photos for one of Northern Ireland’s biggest media outlets, so you won’t be disappointed! We also would normally meet the couple should they decide to book us to discuss their evening in detail. We want to get a picture of exactly what they want and expect, as after all, it is their day and we do not want to disappoint! If you need to see us in action there’s always lots of events which you are more than welcome to come along and scout us out. Just get in touch via the contact us page and we can let you know whats on and where. 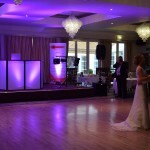 We can also provide a number of live wedding bands if required. ranging from a two piece right up to four piece. 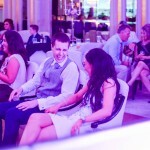 “Nice Guy Eddie” come highly recommended and we have used them the most at numerous wedding receptions across Ireland. 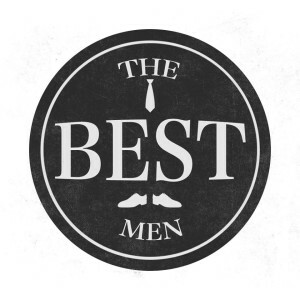 “The Best Men” are a four piece well used to travelling around the country and we had the pleasure of working with them for the first time last year. Warren Atwell, lead singer from “Nice Guy Eddie” has just launched his second solo EP now, view below! Also check out YouTube for his other songs! Taken from Warrens brand new EP, on iTunes now! Last year was our busiest year ever with 2019 not too far behind. So get in touch to make sure we can fit you in!